Located on Moraga St. between 15th & 16th Ave. 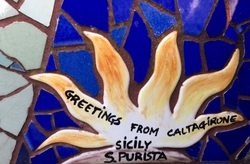 The 16th Avenue Tiled Steps project has been a neighborhood collaboration to create a sea to stars themed mosaic flowing up a 163 step stairway located in San Francisco's Golden Gate Heights Neighborhood. 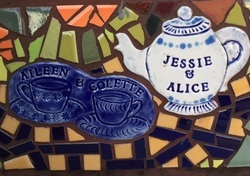 Neighborhood residents Jessie Audette and Alice Yee Xavier started the project in 2003 in a grassroots effort to connect the neighbors in a community project to beautify Golden Gate Heights. 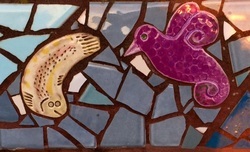 The neighbors chose artists Aileen Barr and Colette Crutcher to collaborate in the creation of a design on 163 mosaic panels. Neighbors sponsored handmade named tiles in the shapes of the animals, fish, shells within the mosaic. Tile sponsorship provided the funding for the majority of the project. Three mosaic workshops were held in the community so that all could participate in the making of the mosaic panels. On August 27th, 2005, we held our Opening Day ceremony. Lion dancers led the way up the steps, firecrackers popping . We were joined by Francesco Pignataro, Mayor of Caltagirone, Italy, home of the Scala Steps and our sister stairway. Supervisor Sean Elsbernd was acting Mayor for the Day and declared August 27 "16th Avenue Tiled Steps Day". The gardens on the south side of the mosaic stairway were donated by the Xavier family. A grant was obtained from San Francisco Beautiful, in 2006, to develop the north side of the stairway gardens. The plantings consist primarily of a variety of species of California natives and succulents. The San Francisco Succulent Society members donated succulents to further enhance the gardens in 2010. In 2014, Nature in the City joined us in butterfly habitat restoration efforts. You can see the California natives planted to support the endangered green hairstreak butterfly on the upper areas of the surrounding hillsides. Volunteer Days are held Earth Day weekend and in the Fall. National volunteer organization, One Brick , San Francisco chapter, has joined us for the past 10 years in coordinating volunteers to help maintain the gardens. We welcome neighbors and visitors to participate. Our appreciation to artists Colette Crutcher and Aileen Barr, our project volunteers, the Golden Gate Heights Neighborhood Association Board, Kai Zheng of KZ Tile, Ned Fennie of Fennie and Mehl Architects, Nibbi Brothers Contractors, Heath Ceramics, EuroWest Tile, Schluter Systems, San Francisco Department of Public Works, Union Bank Foundation, San Francisco Beautiful Foundation. Thank you Sunset Heights Association of Responsible People (SHARP) for your generous grant for safety and out reach ! Thank you Lunar Mining LLC for your $2000 donation for safety and maintenance of Steps! "Very best wishes to you and all involved in the 16th Avenue Tiled Steps Project. Thank you for bringing beauty to our City." DAYTIME burglars-do not leave anything in cars!!! !